I usually buy pre-made drapery panels. A fast and relatively cheap way to dress a room as shown here in this master bedroom I staged with rental furniture, complemented by accessories I bought for the client. I actually get paid to go shopping and I teach you how in course 3, Taking the Mystery Out of Home Staging Consultations. Yesterday I got a call from Bob in Austin who was desperate to help his wife who had just landed her first home staging client consultation and didn't have a clue how to handle it. It's amazing to me how often this happens. Total beginners manage to get a real paying client without even understanding what it is they've just promised to do for them. Needless to say, Bob immediately ordered the new "Staging Diva Home Staging Consultation Checklist With Room-by-Room Client Planning Forms" to help his wife get through the afternoon with her first home staging client. I thought it was sweet that he jumped in to find a solution for her and that he was obviously very supportive of his wife's efforts at starting a new business. The "Staging Diva Home Staging Consultation Checklist With Room-by-Room Client Planning Forms" is really two products in one. The first part guides you through how I do a home staging consultation and the second part, the Room-by-Room Client Planning Forms, are exactly that. I've set it up so all you have to do is put your own logo and contact information on the cover of the planning forms section and then photocopy the rest. I've given you forms/checklists to fill out for every room in the house! You can fill it out yourself or let your client do it as you go room by room during your home staging consultation. Then you'll have a professional looking and complete document to leave with them at the end of your meeting. No more typing up reports after the fact and no more worrying that you'll forget some of the details. It's all laid out for you step by step, just fill in the blanks! Learn more about the Home Staging Consultation Checklist. Learn how you can get this product absolutely F.R.E.E. with course 3 "Taking the Mystery Out of Home Staging Consultations"
Want to be a Stager? On the third day, she sat down for the last time at their beautiful dining room table by candlelight, put on soft background music, and feasted on a pound of shrimp, a jar of caviar, and a bottle of Chardonnay. Then slowly, the house began to smell. They tried everything; cleaning and mopping and airing the place out. Vents were checked for dead rodents, and carpets were steam cleaned. Air fresheners were hung everywhere. Nothing worked. People stopped coming over to visit... Repairmen refused to work in the house... The maid quit...Finally, they could not take the stench any longer and decided to move. A month later, even though they had cut their price in half, they could not find a buyer for their stinky house. Word got out, and eventually, even the local real estate agents refused to return their calls. Knowing his ex-wife had no idea how bad the smell was, he agreed on a price that was about 1/10th of what the house had been worth; but only if she were to sign the papers that very day. Hey, it's summer! I couldn't resist just throwing in a story for fun, especially one with a decorating and real estate angle! I didn't write it, it was sent to me years ago by a friend. I wish I knew who the author was! With summer schedules breaking up the usual routine, now is the perfect time to think about whether your summer will allow you to set aside two hours here and there to listen to the Staging Diva course recordings. If you do, you'll be in excellent shape to launch and/or grow your staging business this fall. Learning from home cuts your costs and time commitment. And did you know that I am the only person teaching home staging in the whole world that has a Masters degree in Marketing and has actually built a successful home staging business? I'm still accessible but with over 500 emails a day, I need help! If you ask Sandy something directly that needs my attention, she will forward your message to me. I'm really pleased by all the response I've received from both new and established home stagers alike to the new "Staging Diva Sales Script: How to avoid the f/ree estimate trap & turn homeowners into home staging customers in one phone conversation." Readers find that it makes a big difference in how they talk to prospective customers and how many end up hiring them. I'm really committed to putting an end to the ridiculous practice of doing f/ree estimates, which invariably end up being f/ree consultations. It's a fast road to burnout and bankruptcy. So I'm pleased to hear that my new Sales Script is helping do just that. Don't forget to send me your success stories so I can write about you and give you some f/ree publicity! I'm just back from 9 days in San Francisco, where I stayed at the W Hotel next to the Museum of Modern Art. Their hip decor is fabulous which is a big part of why I chose it for my home base. It didn't hurt that it was also part of the travel miles program I'm on and so I was able to stay there on points alone, a savings of over $3000 (you should be earning travel points, f/ree groceries, or some other bonus for using your credit card. If you're not, look at switching). It was a great trip and the first time I completely cut myself off from business for that long a period of time. A very special thanks to my executive assistant Sandy who kept everything running so smoothly in my absence! Ironically, National Post ran an 8-page spread on me in their Summer Homes Magazine while I was away. I wouldn't have even seen it if it weren't for an ex-neighbor who recognized me in the magazine and saved me a copy! More in Staging Diva in The News in this issue. P.S. In the spirit of summer, I decided to include a completely non-serious (though real estate related) story in the hopes that it will give you a chuckle. Make sure you read A Summer Tale in the left column of this issue! 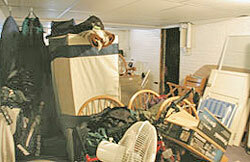 No matter what neighborhood you're in, a high percentage of your clients will be living with rooms that look like this. 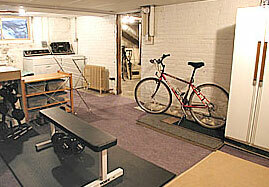 By the way, this was the basement of the very first paying client's house I staged in January 2003. To envision how you'll create this 'after' from the mess takes some time and if you're looking at your watch wondering how you'll make it to your next appointment you don't have the time to think it through properly. I used to race around like a mad woman trying to fit 10 homes into a week, always afraid to put a client off who needed me and fearing if I didn't see them right away they'd disappear and find another stager. Then I realized that if you're good at what you do, and in demand because of it, clients will actually wait for you to be available. This realization allowed me to look at my business in a whole new way and think about what scheduling decisions would serve my needs too. After all, we're in our own businesses, we should try and set things up in a way that will make us happy, right? When I'm booking home staging consultations, I only book one per day. Yes, these are paid consultations, I don't do free estimates. Somewhere in my second year as a professional home stager (I should have done this much sooner), I made a list of all the things that were driving me crazy about the home staging business and tried to figure out solutions to each. will there be time to eat before the next home staging consultation? what food can sit in my car for three hours and not make me fat (or lose control of the car) as I gobble it down while rushing to the next house? how long will it take in traffic to get to the second client's house? how long will the second appointment take? will there be enough time in traffic to make it to after school pick up or do I need to arrange childcare? when will I figure out what we're eating for dinner and buy it or make it? Well after lots of pondering and writing in my journal about what was stressing me out, the answer finally came, "what if I only agree to see one client per day?" Having one client per day gives me breathing room if the appointment goes longer than expected and leaves me time for all the other things I do running a staging business (shopping for clients, going to the bank, paperwork, etc.) and keeping up with home and family demands. With that one simple change my whole outlook on the staging business changed. I was having more fun, I was calmer and paradoxically my income actually went way up! As Staging Diva students know, I'm a big believer in creating the kind of business you want to work for. In course 1, C@ash in Decorating Homes To Sell, I discuss all the possible services you can offer as a home stager. In course 4, Staging Diva Sales & Marketing Secrets to Boost Your Home Staging Business, students learn the various marketing approaches to building a staging business. But throughout I advise you make conscious decisions about your business so that you won't grow a financially successful home staging business that makes you miserable. It's not just about making m0ney, it's also about living the kind of life you want. I've lived the life of a home stager since the fall of 2002 and learned so much through trial and error as I built my staging business. You can figure it all out by yourself, or you can take a huge short cut to big pr0fit and start your business with what I learned the hard way. Life is hard enough, why not build your business faster and with less effort? My goal with the story was to educate the general public about what home staging can do for them, especially in a slower real estate market. That idea really comes across in the article, which I'm glad about because you never really know what they'll use. For the second time in two years, I'm proud to be featured prominently in CNNMoney. This time it's with a 22-page article about my House Selling Secrets, the Staging Diva Directory of Home Stagers, and tons of before and after shots of my staging projects. Directory members, have been getting tons of exposure since the third paragraph of the article links directly to them! 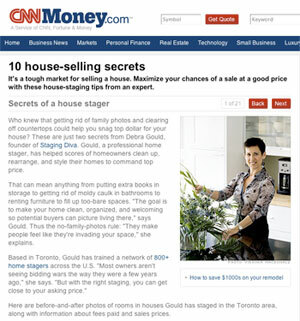 This will be a huge boost to the Staging Diva Directory's ranking with Google since CNNMoney is such a high traffic site. Learn how I help you get exposure like this for less than $40 a month (when you commit for one year). This story also ran as the front-page story on ThisOldHouse.com and you can still find it there. Please visit and add your comments, it's a great way to get exposure for your name and that you're a stager and also to balance the negative "anonymous" comments already made. There will be a bigger print story running in This Old House Magazine sometime after the fall. The editor decided to start the story online rather than waiting for the print issue to be released. With a circulation of over 6 million, the magazine will further expand the reach of the Staging Diva Directory of Home Stagers as a resource for homeowners and agents. The story was also picked up on the front page of AOL Real Estate, you can still see it online here. 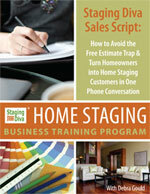 Home Business Magazine is featuring Staging Diva in their October 2008 issue. 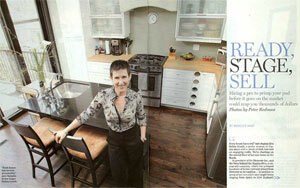 National Post Homes Summer 2008 ran an 8-page feature on me and included many shots of my new house. That's my kitchen above. In fact July 26 was the anniversary of us moving in. In the last year, there have been three shoots here: one for HGTV (airing this fall or winter) and two magazines. Usually my house stands in for a staged home as it was supposed to in this article. But to my surprise they ended up saying it was mine. Honestly, if you're a Graduate of the Staging Diva Training Program and you're not in the Directory, what are you waiting for? Where else are you going to get exposure like this among people actively looking to hire a home stager? had rewritten his sign and wanted to know what he had written on it. the message a little differently." He smiled and went on his way. Today is Spring and I cannot see it. If you're not getting the sales results you want, perhaps it's time to find a new way of doing things or a new way of saying things. If you can't figure it out yourself, consider what a difference an expert can make in your end results. "I want to thank you again for your business advice, I'm sure I wouldn't still be in business without it!" 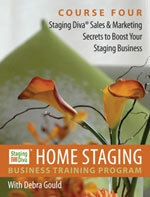 If you're a Staging Diva Graduate, you also have the option of joining Staging Diva Dialog. For only $47 you get a full hour with me on the phone in a small group, to ask your questions and also learn from what other Graduates ask. Not only that, you get a recording of the live call! These calls are held on the third Thursday of each month and I always bring a new topic I want to teach about in addition to answering your questions. You're guaranteed to learn something that will be worth at least 10 times the cost of the call! Congratulations to Staging Diva Graduate Sue Kilmer of Suzy Home Stager (CA) on her excellent new logo design and getting the word out about her business. We finalized her company name during our business coaching call together and I'm so proud of the logo she had developed from there. Sue writes, "Thanks for our coaching session! It was great and we accomplished a lot. I am getting lots of attention as people hear what I am doing. There is a very positive response and it's a lot of fun for me to see the smile people get when they hear my business name! I had a car window decal of my logo made which has led to several key conversations educating people about Home Staging. I have been offered a couple of jobs and been invited to speak at a local Real Estate gathering. They are going to do a write up on the business in our local paper too." You can learn more about how to get an effective logo designed in "Staging Diva® Ultimate Guide: Creating The Perfect Portfolio to Sell Your Home Staging Services"
Congratulations to Staging Diva Graduate and Staging Diva Dialog member Donna Dazzo of Designed To Appeal (NY) on renewing her Staging Diva Directory of Home Stagers for a full second year. Donna has staged some amazing properties and received great media coverage, most recently in The New York Times! Congratulations to Nicole Hurst of Cole House Design for co-writing an article about home staging and having it published in the July issue of New Dream Homes and Condos Magazine. Patti Egan of Egan Design Group Inc. Serving Ontario: Georgetown, Halton Hills, Mississauga, Milton, Caledon, Erin, Guelph, Oakville, Brampton and Campbellville. Becky was a past advertiser who came back to the Directory and took advantage of the chance to rejoin for only $90. Staging Diva Students and Graduates, send me your successes so we can celebrate your triumphs and inspire others! PLUS, being included in this newsletter gets you a F/ree home on my newest website. I also feature Graduates in my blog. Google indexes those stories the same day I post them, which is excellent F/ree publicity that I give you (but you have to do your part by sending me information I can use)! The more links I provide you with, the better for your business growth.